Now that the weather in the UK has brightened up a little, it’s nice to walk outside jacket free! Here I opted for a classical and simple look, pairing together skinny jeans and heels; a great way to dress up simple items in your wardrobe. The main elements of this look are my shoes (Valentino) and bag (Celine). 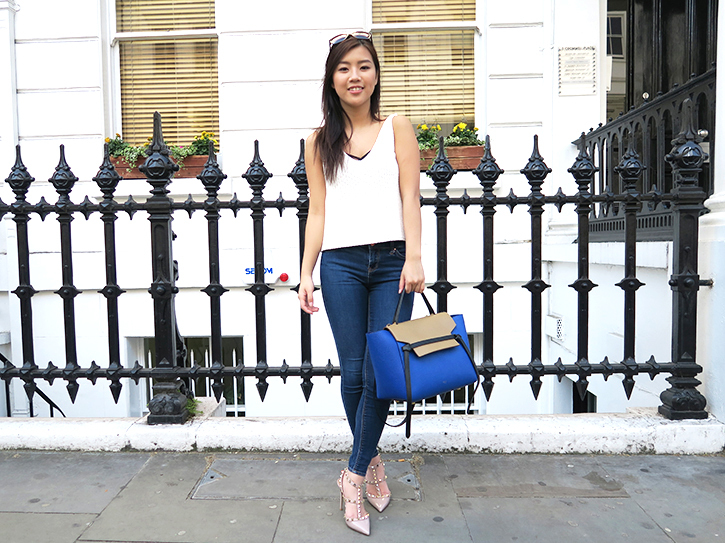 A relaxed outfit with a plain knit and denim jeans, allowing the details of my heels to give subtle statement and adding a multi toned bag for a pop of colour; even though I am wearing blue jeans, the indigo blue on the bag truly stands out against the white knit top. Because of the studded detailing on the shoes, I didn’t want to add a statement necklace to divert the attention so instead, I layered a bralet underneath for extra detail on the neckline. I hope you guys enjoyed this outfit post; this is a really easy look to put together, ideal for lunch dates or a drink in the Sun! I would love to see how you guys recreate this look, so tag me or tweet me!